I have no idea where I got this CD from. I assume it must have come in one of the Waterslide packages that Kazu sent me, but it's been sitting in a pile of stuff in my room. I don't have any artwork for it, just this disc. Recently, I realized I hadn't ever played it and popped it into the CD player. Wouldn't you know it, it's actually a pretty great album that's been hiding out in my room for about a year now. This ten song album is full on melodic punk rock from Japan, with the hooks in all of the right places and singalong choruses. This album is on the poppier side of the Japanese punk spectrum and I think they have more in common with bands like Hateman than they do with I Excuse. The standout tracks for me are "Lost One's Face" and "Something." Normally, I'm not into bands that have songs that are named after the band's name, but both of these songs are fast, dynamic rockers with killers hooks. I'm really impressed with this CD. It's great and has totally taken my by surprise. 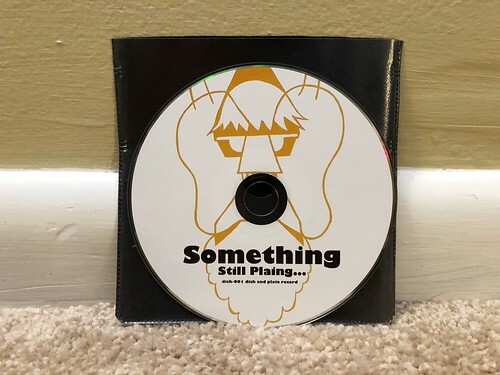 I would really like to get ahold of the artwork that goes with the CD, so if anyone happens to have a sleeve with no CD in it, please let me know, it's probably mine.